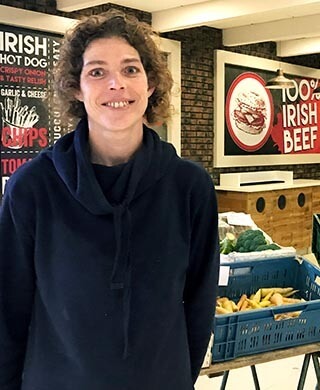 With customers becoming increasingly concerned about the quality of their food and its provenance, more and more Dubs are turning to farmer’s markets. 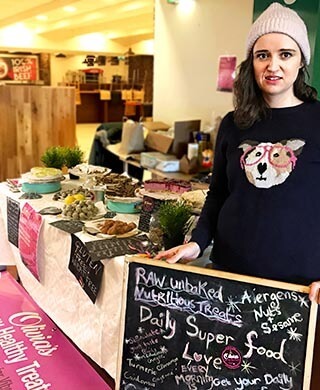 We spoke to five market sellers at Leopardstown Farmer’s Market to get to the bottom of what these markets can offer that other shopping experiences can’t. 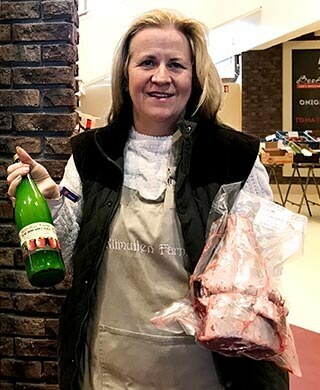 Margaret farms lamb, apples and sweetcorn at Kilmullen Farm and sells her produce seasonally. We are seasonal producers of lamb, apple juice and sweetcorn. We sell all of the lamb from heart, liver, kidney right through to full leg, half leg, shoulder, racks and diced. We accommodate smaller families and people living on their own with half racks and packets of chops. This time of the year, with the cold weather, diced shoulder is very popular for stews and curries. The apple juice we have here is called the Ophelia Range, so-called because all the apples fell during storm Ophelia. We made beautiful juice out of it. Normally we pick them later, but the storm was the boss this year. We’ve been in business for a few years now. Markets like this offer a personal experience. We offer recipes and tips on cooking. I can tell my customers about the lamb, what type of lamb it is at this time of year, the omega threes that are in it. We’re Bord Bia Quality assured, and provenance is hugely important. That separates us from the big chain experience. 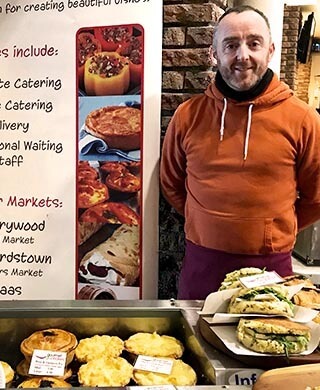 Declan owns bakery business, Gourmet Grub Bakery. They create sweet and savoury gourmet treats for all occasions. I started my bakery business seven years ago after I was made redundant. It was either sink or swim. I started from home then moved to my parent’s house where I converted the garage into a small Bord Bia approved kitchen. Now we operate from a large industrial unit in Dublin town with a small team. People are looking for quality, fresh food and value for money. There’s also a lot of people avoiding gluten or dairy, so I’ve adjusted my recipes to cater for them. We have a lot of vegetarian options too. At a market you get to meet the producer, you can talk about your food. My customers give me feedback and encouragement. You hit the wall so many times, but when you get a compliment, it picks you back up again. You have a special relationship with your customers; it’s very important. 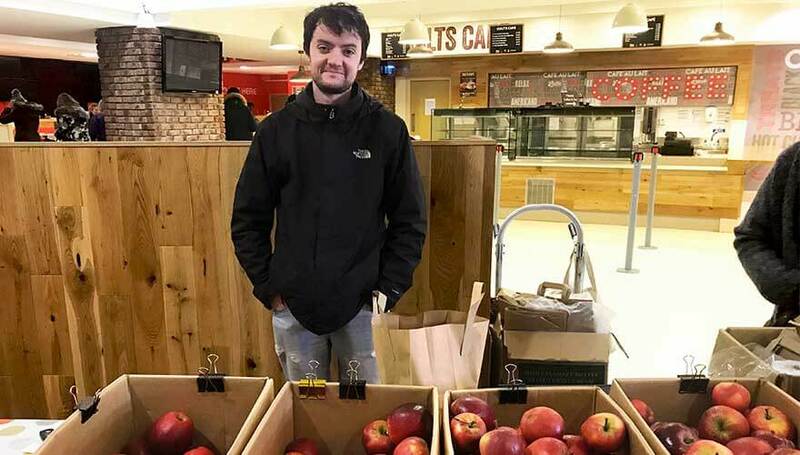 Peter Goode and his family have been selling fruit and vegetables at Leopardstown market for five years. We sell seasonal fruit and vegetables, mostly from North County Dublin. We have honey and juices today as well. In the summer we sell strawberries, blueberries, raspberries and stuff like that. We’ve been coming to this market for five years now, and we have our regulars. The market is more personal than other shopping experiences. You get to know people, have conversations with them. Our customers want to buy Irish produce, as local as possible. The apples we have today are from Tipperary. They taste so much better than what you would get in the supermarket; they have real flavour. I didn’t even like apples before I started doing this! Gerta sells local and imported fruit and vegetables. She previously manned a stall for another farm but has recently gone out on her own. I source a lot of my veggies from local farms in Wicklow. There’s Oliver Kelley’s farm and David Butler who has organic eggs. I import other fruit and veg from various places, a lot from Holland, Italy and Spain, we can’t grow oranges here. When you come to a market, food is fresher. The bakers bake the day before, same with the farm produce. We harvest the day before market. People are more interested in where their food comes from these days. That’s why you see signs with country of origin on my carts. The traders know each other. I have peppers, sweet potatoes, ginger and that kind of stuff. Another stall over there has all of their own farmed produce, like apples. We try not to overlap. At the market, people can have a coffee, meet their friends, have lunch. It’s a nicer atmosphere than any supermarket. Olivia has a healthy treat business, Olivia’s Raw Treats. She has just started to sell her everything free desserts and snacks at the market. It all started when I was overweight. I was comfort eating, lots of chocolate and everything bad for me. So, I decided I was going to try to enjoy dieting. I wanted a substitute for all of that chocolate. I looked at the cost of things in health shops, they cost a lot and there isn’t a lot of choice, so I started making my own healthy treats and lost three stone. My friends started coming over and I was thinking “Are they coming over to try my treats or to actually come see me?”. I’m very conscientious about where I source from. I use high-quality ingredients, sourced from really good places. I use seeds, whole pressed oils, raw cacao powder, coconut and nuts. It’s all gluten-free, dairy-free, sugar-free, wheat-free. Everything free! But, in the end, it’s all about taste. You have to satisfy your taste buds. I love the buzz of the market. I’m fairly new to this one and I’m enjoying chatting to people and educating them. I want to introduce people to this type of food. I want to help people to realise that healthy eating doesn’t have to be boring or a pain. I just want to spread the love.